Artistic rendition of India's INSAT-3DR satellite, courtesy of ISRO. Next-generation satellite INSAT-3DR has opened new frontiers in India’s weather forecasting and is set to equip the country with the ability to detect farm fires, which intensify air pollution in the northern region seasonally, leaving Delhi gasping for breath. A team of the satellite meteorology division of India Meteorological Department (IMD), housed in New Delhi’s Mausam Bhawan, has amassed a huge tranche of data relayed by INSAT-3DR over the past few months, at an average rate of a whopping 142 GB per day. Launched in September last year, INSAT-3DR works in tandem with INSAT-3D, operational since 2014, in sending raw data and high-resolution images, zoomed up to one km near the earth’s surface, every 15 minutes. 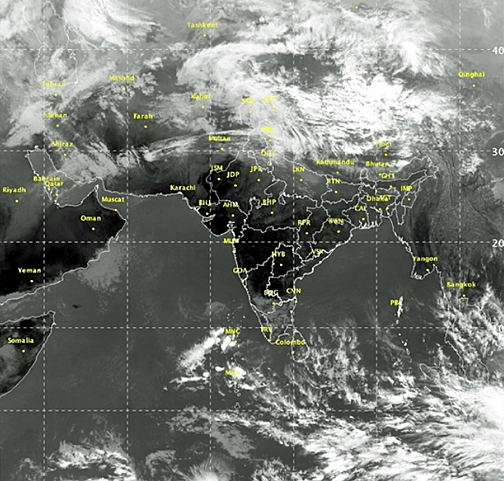 Image sent by the INSAT-3D satellite, courtesy of India Meteorological Department. Dr. Sunil Peshin, who heads the division, stated that while storing and archiving data was itself a challenge, the IMD shares information relayed by these satellites with international agencies like the US-based National Oceanic and Atmospheric Administration (NOAA). Peshin said with the operationalizing of INSAT-3DR, night time monitoring of atmospheric phenomenon like cloud cover, fog, haze and snow among others has become possible. “Within the next few months we hope to equip ourselves with the ability to detect farm fires as well which the NASA (National Aeronautics and Space Administration) does currently. It is just a matter of developing the right tools and algorithm which will take a little time,” he said. This assumes importance against the backdrop of the Delhi government blaming seasonal agro-residue burning in the fields of Haryana and Punjab and the subsequent emission of smoke for the city’s foul air, especially during October and November. A.K. Mitra, a scientist with the satellite research and calibration/validation unit of the division, explained that apart from night-time monitoring, INSAT-3D/3DR has enabled forecasters here to prepare a ‘vertical profile’ of weather data which comes in handy in case of extreme weather events, picking last year’s Chennai floods as a case in example. “The ‘Sounder’ payload of INSAT-3D/3DR provides vertical distribution of temperature and moisture which also gives more information on the nature of fog and its potential of remaining suspended or lifting. It can be put to great use by the railways and the airlines,” Mitra said. Both Peshin and Mitra concurred that the advanced weather forecasting capabilities could be put to greater use by training staff of the public transport sector like railways in handling the ‘RAPID’ tool (Real-time Analysis Product Information Dissemination) available on the IMD website. 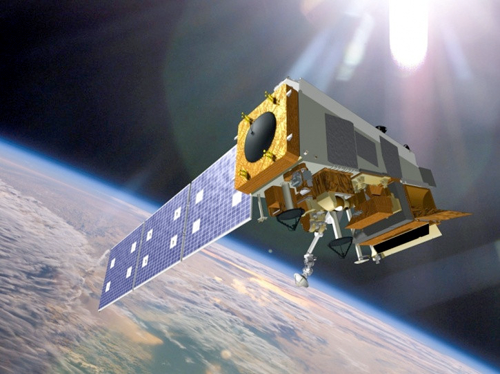 The officials said the other set of weather data that INSAT-3DR measures using its ‘Imager’ payload include sea surface temperature, snow cover, snow depth, smoke, aerosols, water vapour, wind, flash floods. INSAT-3DR, which weighs 2,211 kg and has a designed mission life of 10 years, was launched by ISRO’s (Indian Space Research Organisation) Geosynchronous Satellite Launch Vehicle (GSLV-F05) on September 8, 2016. Apart from ‘Imager’ and ‘Sounder’, the payloads of INSAT-3DR include ‘Data-Relay Transponder’ and ‘Satellite Aided Search and Rescue Transponder’. The former transmits meteorological, hydrological and oceanographic data while the latter picks up and relays alert signals originating from distress beacons of maritime and aviation among others.